The existence of wild horses in the US is in jeopardy. The Bureau of Land Management (BLM) is at it again, continuing to support the interests of ranchers, and its latest plans involve rounding up horses in Wyoming’s Checkerboard lands. 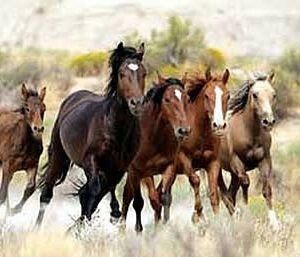 The 1971 Wild Free-Roaming Horses and Burros Act requires that the BLM remove wild horses from private land, if requested by the land owner. However, the BLM is perverting the Act to remove wild horses from not only private lands, but also from public lands. If a round up goes forward in Wyoming’s Checkerboard lands, the BLM could argue that it should be able to round up wild horses anywhere, when it is absolutely illegal to do so! Once captured, horses can suffer greatly in the confinements of the BLM. In the past several years “at least 100 horses were killed during the roundup itself or in the months following their capture in the BLM’s holding pens,” according to American Wild Horse Preservation Campaign. Along with the cruelty and threat to the makeup of the US wild, there is a huge financial burden to taxpayers for the program. It has been stated that, “Congress appropriated more than $77.2 million to the Wild Horse and Burro Program in fiscal year 2015. Of the total $75.1 million spent, holding costs accounted for $49 million. Roundups and removals cost $1.8 million. Adoption events cost $6.3 million.” You can read more about the atrocities happening in Wyoming here.